My house has wool tucked in every corner . I fell in love with wool, sheep and spinning in the early 80’s and collected all kinds of wool like there would be no more. Now in my early 70’s I am trying to find uses for it all. I hope to finish some of the projects that have been sitting around this month.. This is one of the projects which needs to be finished I have been working on it for years. Each area inteminated me and certainly brought me out of my comfort zone in hooking. Thank you Deanne Fitzpatrick for pushing me forward on this project. WIthout your example I would have never attempted it. I am still spinning and took up rug hooking and made many huge rugs but my supply is still there. This year I am going back to weaving in hopes to make woolen rugs and I hope that will deplete my boxes and boxes of lovely dyed handspun. I have found there just isn’t a kind of wool that I don’t like, even the coarsest of wool’s have uses in rug making and felting. On a recent trip to Ireland I could not resist these wild colors at Kerry Woolen Mills. I have started some fleece lined mittens with this wool. I still have 4 sheep and love the quiet life of being a shepherdess. 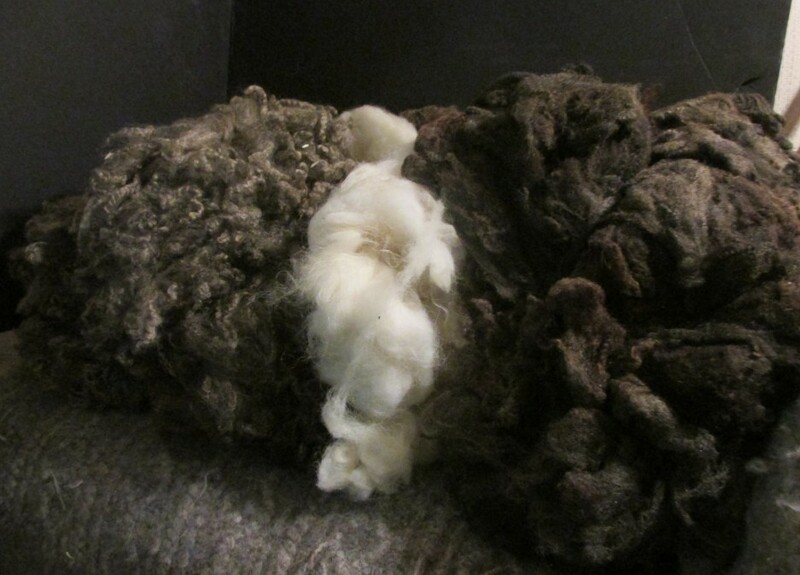 This year I plan to send the wool out to a mill and have it made into yarn. It is a wonderful way for me to share my love of sheep to others. Word has come to me that Hannah Hauxwell Of England has passed away and I wanted to share this with you. She was 92. She lived on a remote farm for most of her life and at age 35 after her parents passed, she took over the day-to-day chores on the farm. In this very remote area there was no electricity or running water. She battled poverty and hardship most of her life and did this all alone. She was discovered and her life brought to the public eye through wonderful documentaries and her books and her life did get somewhat easier. She carried a bale of hay on her back to feed her beloved cows. When she felt she could no longer continue on the farm she, with help moved to a small town nearby. Leaving her beloved cows was one of the saddest things but a neighbor agreed to take care of them. The documentary’s can be seen on you tube and her books are available from Amazon. She was such an inspiring woman.